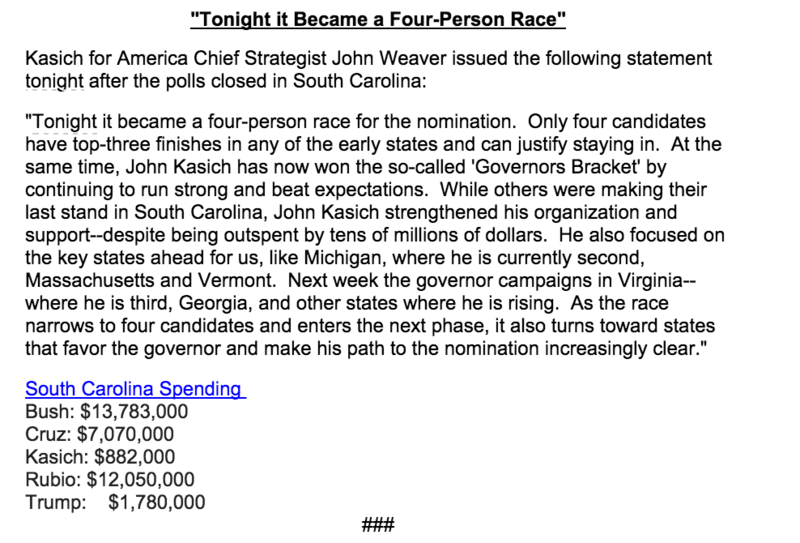 At the moment, he’s in fifth in South Carolina, trailing John Kasich, whose campaign put out a statement saying it’s become a “four-person race.” (It’s not.) Bush came in sixth in Iowa. He came in fourth in New Hampshire. He invested a lot in South Carolina, dragging his brother out onto the campaign trail even though it would have come back to haunt him if he made it to the general election. And he’s polling dead last in Nevada. There are several reasons why his campaign never caught fire. He was a bad candidate. The base was in no mood for an establishment choice. And Donald Trump simply took over the race. To the credit of the Republican electorate, at least there is no desire to put another Bush in office. Update: Bush has officially dropped out of the race. What a world.